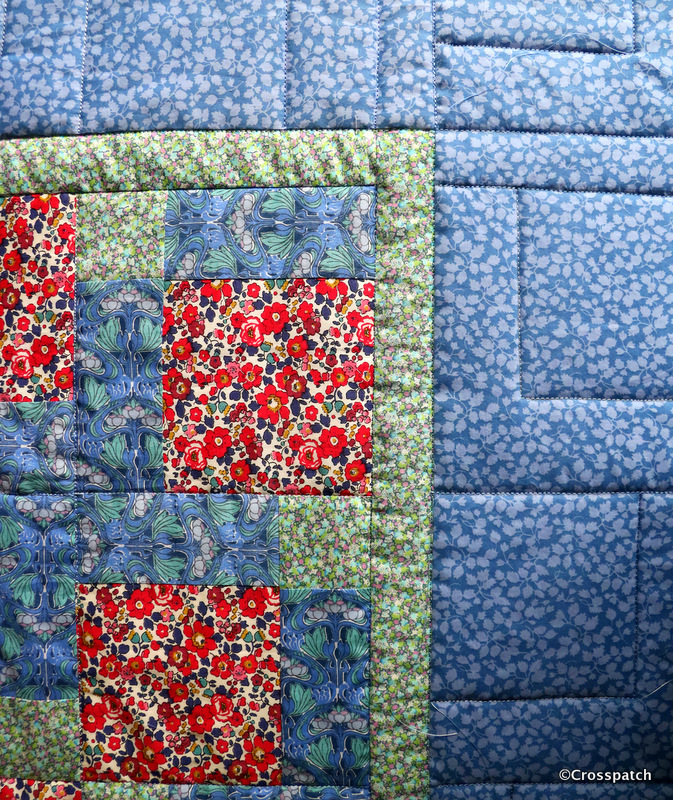 We all deserve a little luck occasionally; this quilt was made from a little bit of mine. 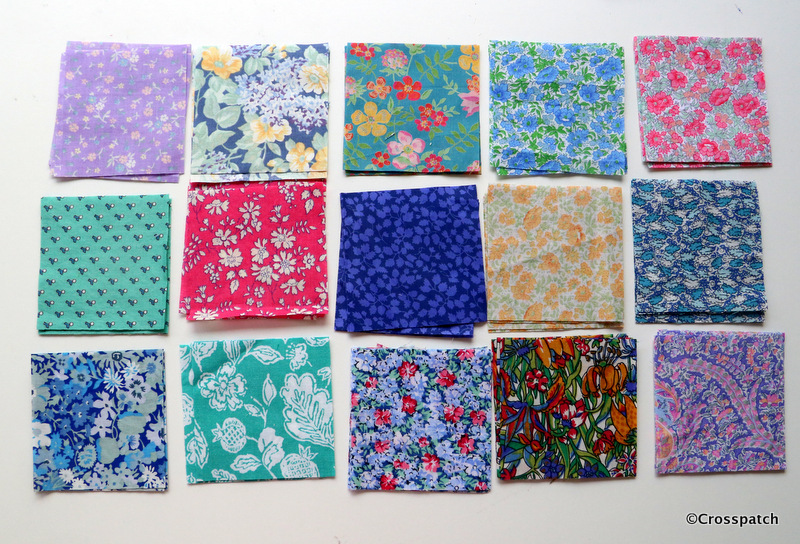 I’m lucky enough to live near a company called Standfast and Barracks, they print fabric for Liberty and Designers Guild amongst others. 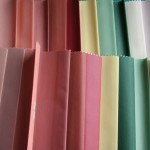 They have a factory shop where these fabrics can be bought in small amounts for discounted prices. 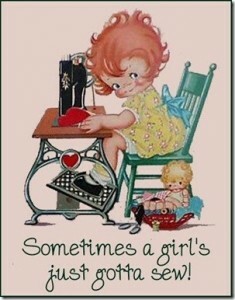 You won’t be surprised that I shop there often. They also have a facebook page. 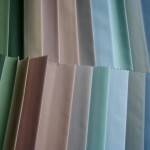 (https://www.facebook.com/search/top/q=standfast%20%26%20barracks%20fabric%20factory%20shop ) and some time ago they ran a little competition to win some fabrics … guess who won? 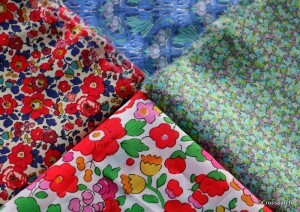 I won… Four lovely pieces of Liberty Tana Lawn; now what to make? 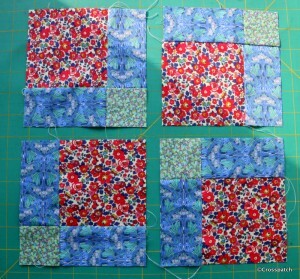 I decided to make a disappearing nine patch, I had only used that block once before but I knew it would go together quite quickly, and I liked it, you don’t need a better reason, do you? I fiddled around for a while trying to work out the placement of the fabrics and came to the conclusion that I needed more contrast, a different colour. 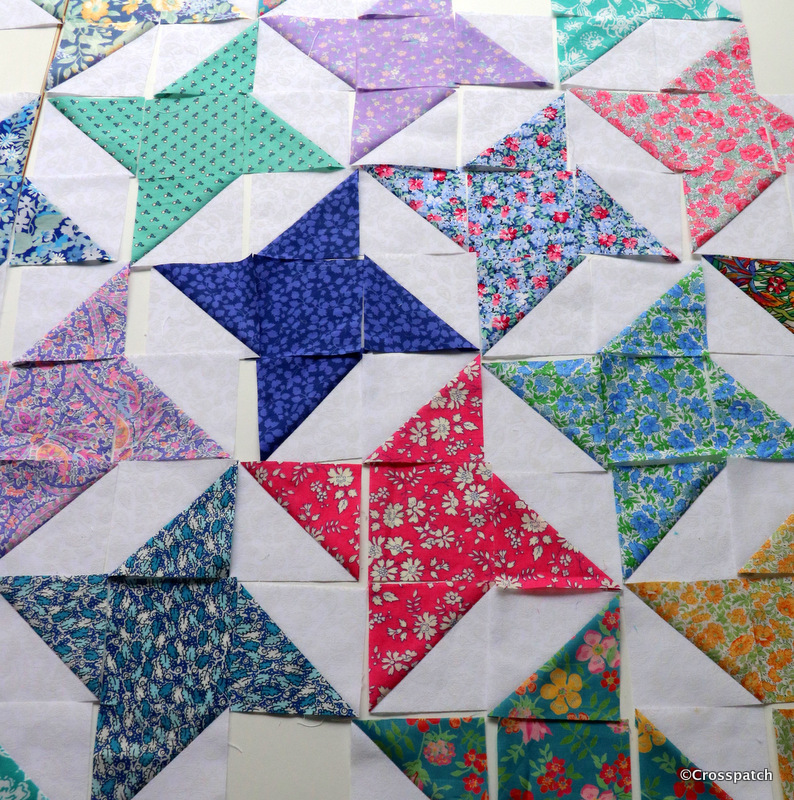 I dug out my enormous stash of Liberty Tana lawn remnants from Standfast and Barracks, and found a blue which I thought would work. 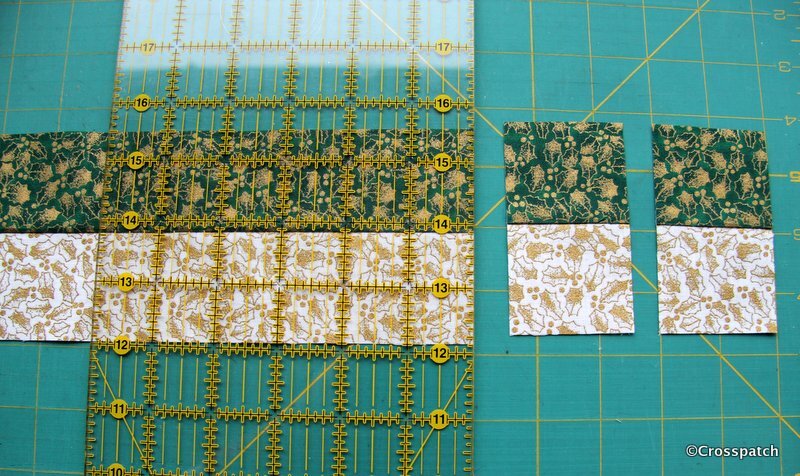 Thinking about the balance of your fabrics in simple terms, the fabric you want to use the most of or to be the dominant fabric should go in the corners of the nine patch block . 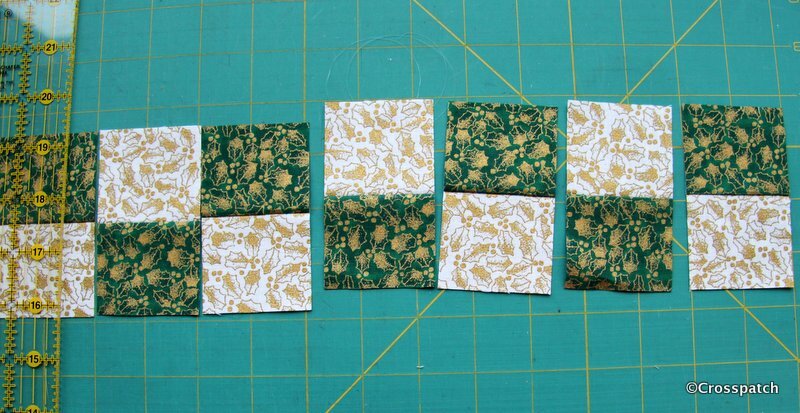 The next fabric or fabrics should go on the four sides of the nine patch , you could use all one colour as I did or you could alternate two colours which would create a completely different look. 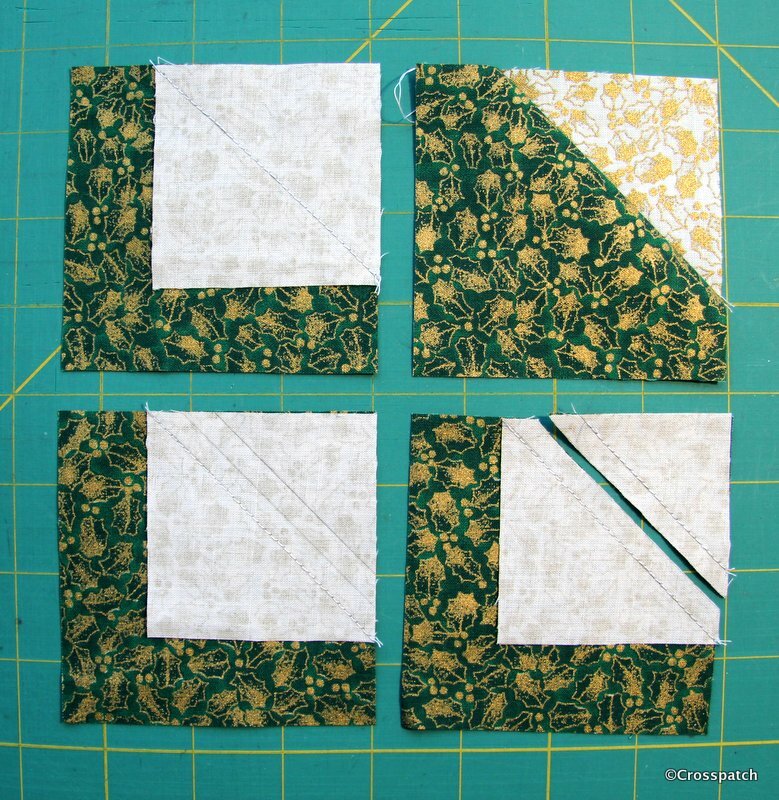 NB , if you use a fabric with a directional pattern, as I did the pattern should not be placed the same way up, but directed from the sides to the middle of the nine patch block, otherwise when you cut it up and try to put it together again, you’ll find the pattern going every which way. It won’t work. 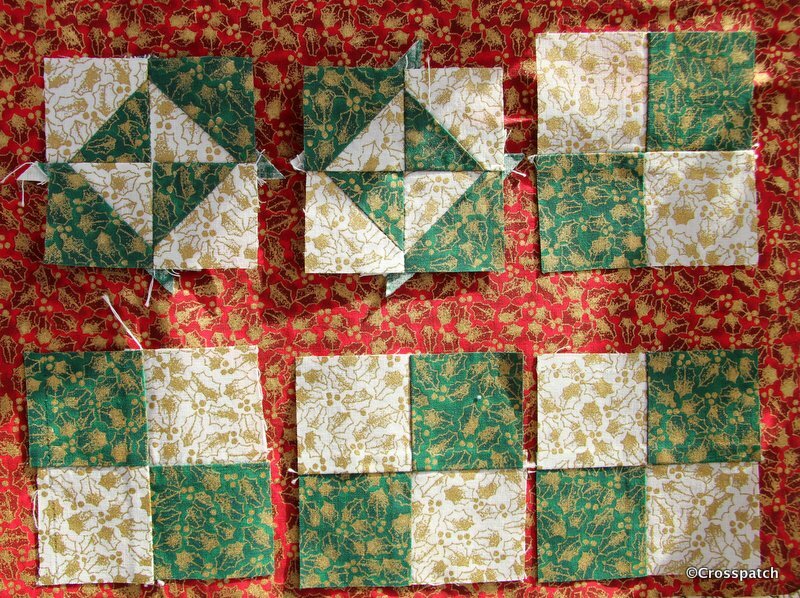 Finally the fabric you have least of if you are using scraps, or you like least, or would dominate the quilt if used in greater amounts, goes in the centre of the nine patch block. 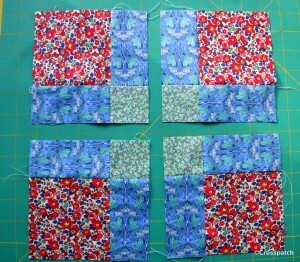 The disappearing nine patch block has a balance of fabrics which is expressed by 4, 2, 2, 1 . 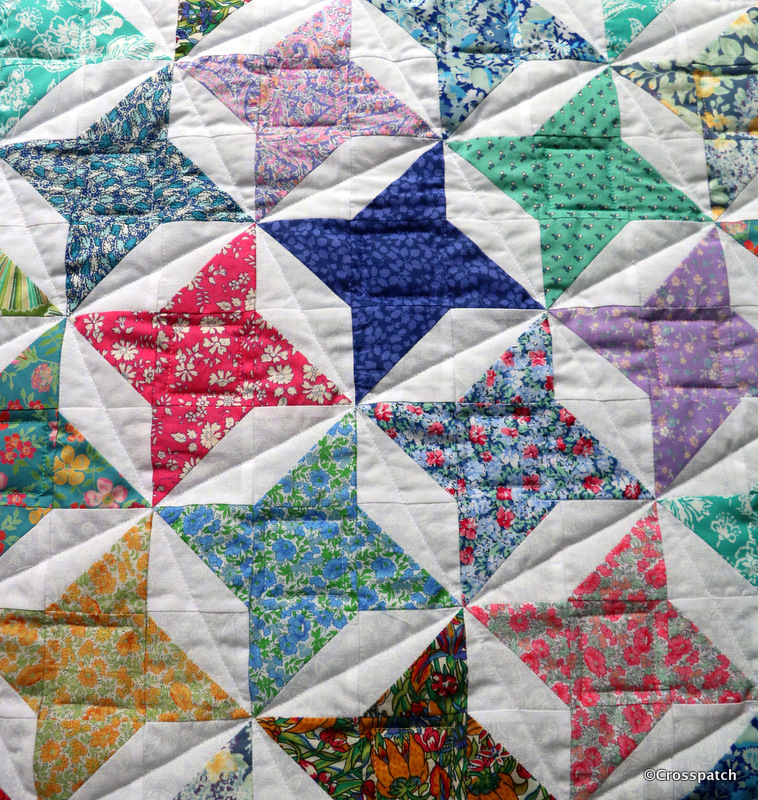 The largest patch is 4 times bigger than the smallest and the middle sized patches are half of the larger, if you see what I mean? 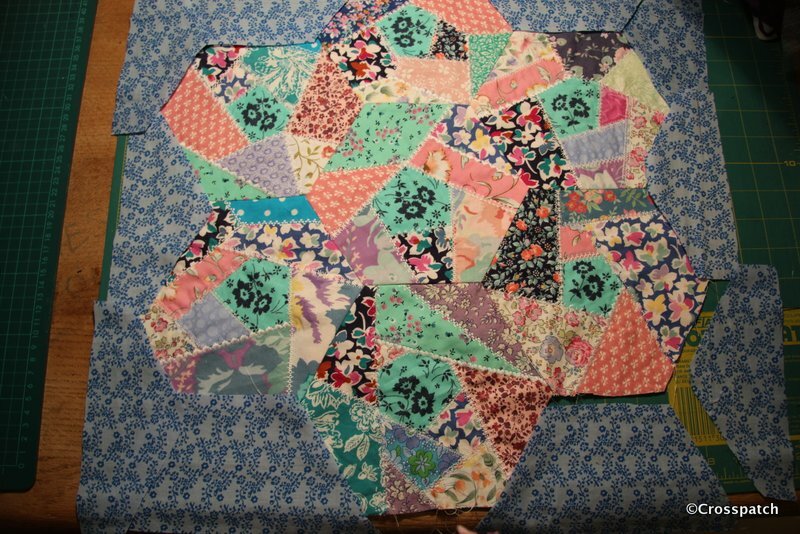 Having put together the nine patch I cut it into 4 quarters and put it back together having turned two of the quarters 180 degrees. All the blue patches are aligned in the same direction. 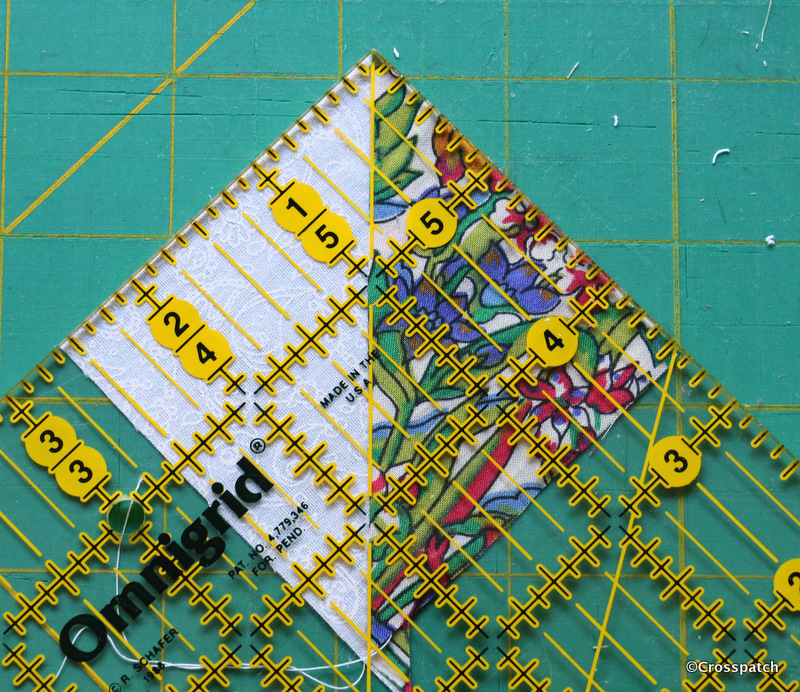 If two patches had the pattern aligned along the length, and the other two along the width, it would be visually distracting. 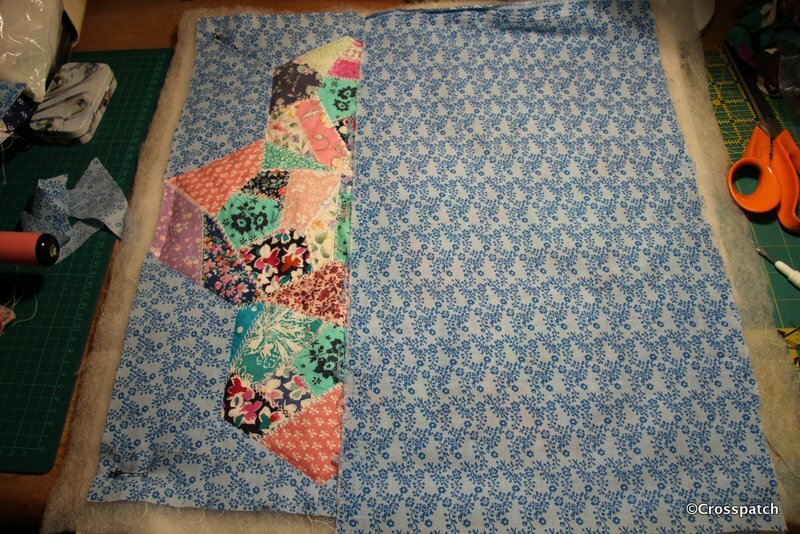 Nine nine patch blocks gave me a 30” quilt top and used up all of the flowered and the blue fabrics, to make it big enough for a lap quilt usually 40 -45 “ square, borders were needed. 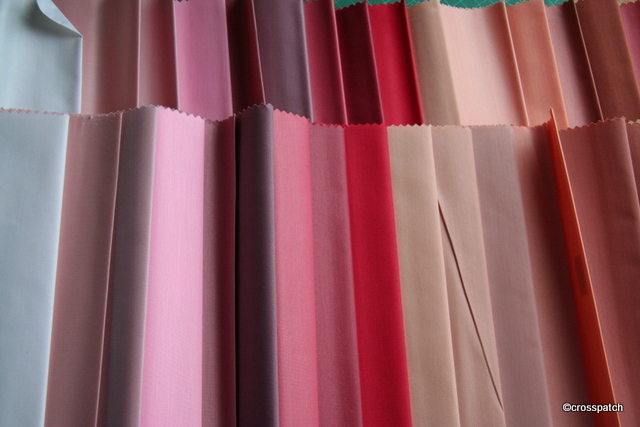 First I considered a darkish blue… too dark, then a bright watermelon pink… too bright. 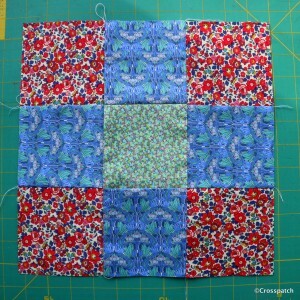 I thought it would dominate and make my pieced disappearing nine patch centre look dull. 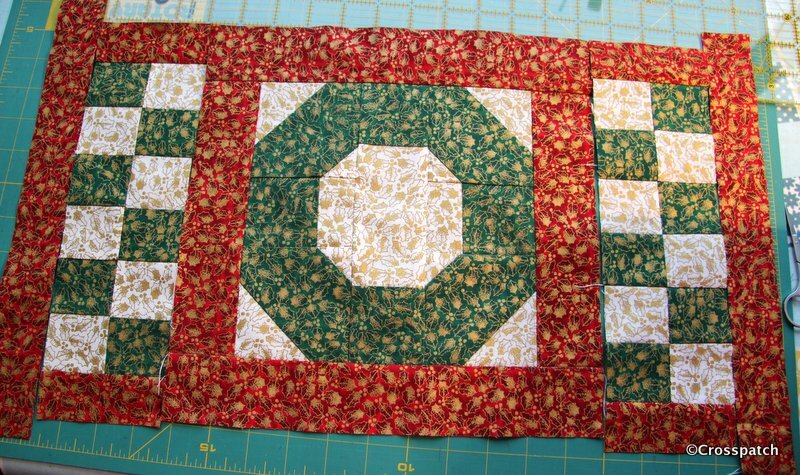 I added a narrow green border to separate the pieced top from the outer border, using the green helped to balance the colour across the quilt and use the green up too. 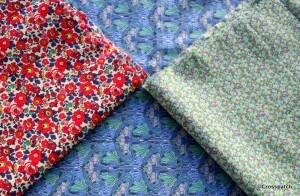 Finally I took my centre back to Standfast and Barracks, draped it over the rolls of fabric for sale in the shop. I found another blue that worked for the border. 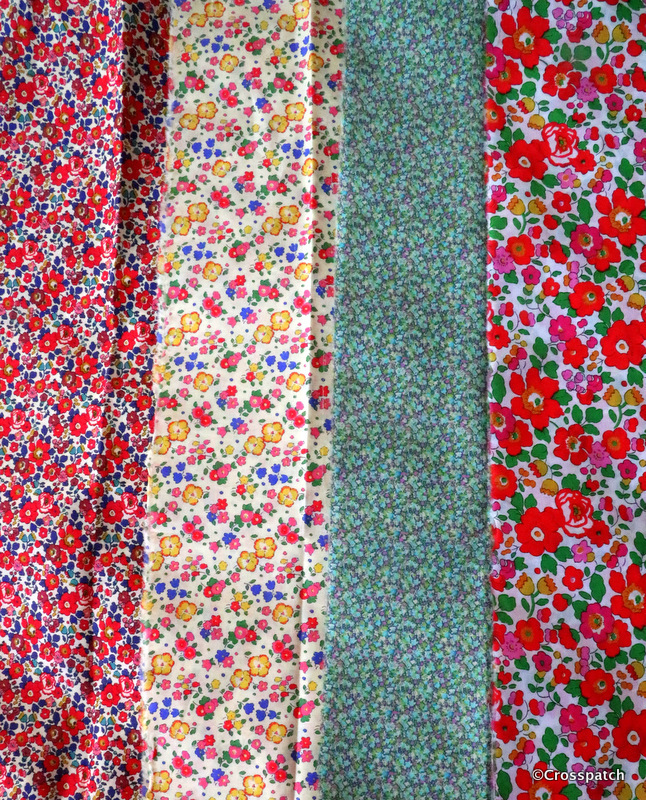 I also bought a piece of the flowered fabric big enough to back and bind the edge, leaving enough left over for the hanging sleeve too. 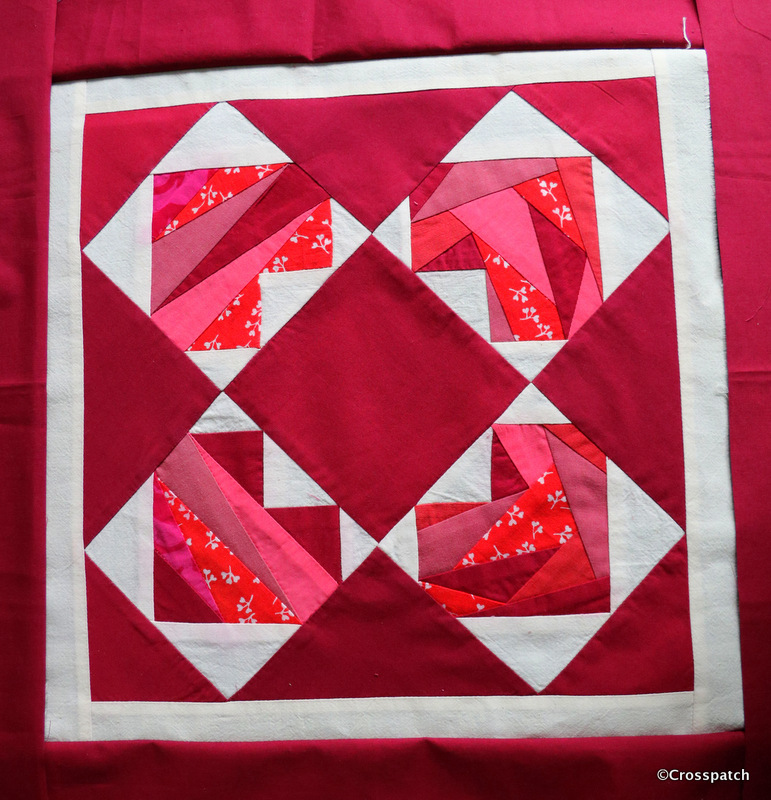 I planned to submit this to my quilt group’s exhibition; the third of my three items, and thinking it needed to be handed in in a few days time I was in a hurry to finish it. 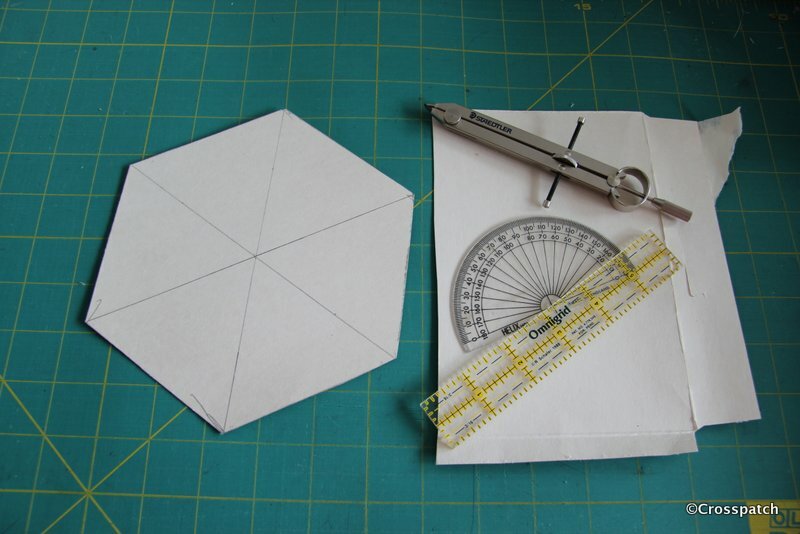 The last time I had used this disappearing nine patch block I used a circular quilting to balance the very square pattern, I began to mark out the circles, but my disappearing pen was dried up and useless, pencil was too laborious, I had to do something simple. 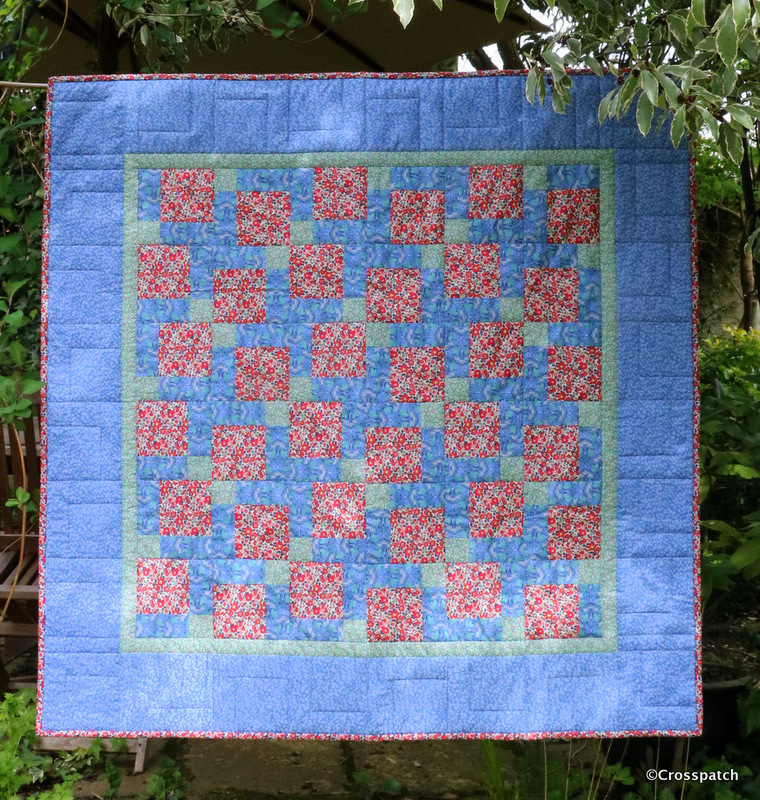 It’s stitched in the ditch, just outlining each quarter block, and the border follows the pattern of the disappearing nine patch block in a simplified form. 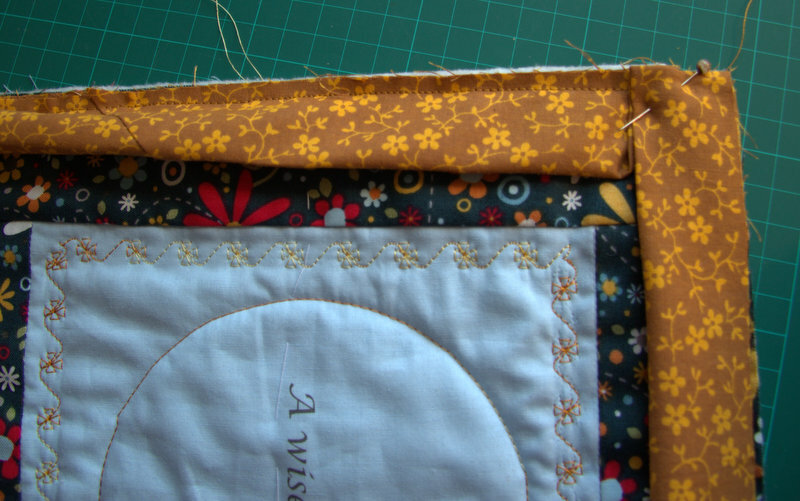 The binding was stitched onto the front, rolled over and tacked down over the stitch line on the back, almost ready but time was up. 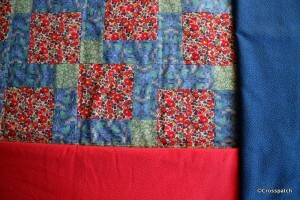 I drove out to the village where my Quilt group meet to hand it over, only to find I was a week too early. Curses! 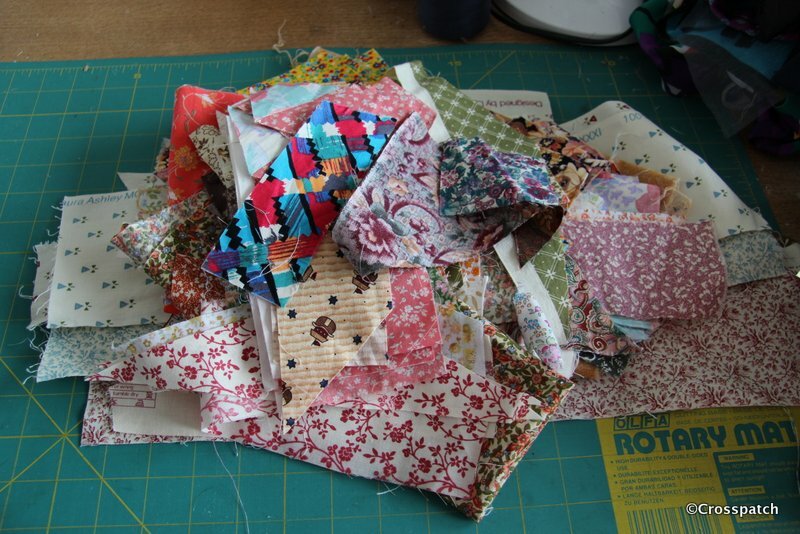 Well at least I now have time to stitch that binding on, and take it back next week. 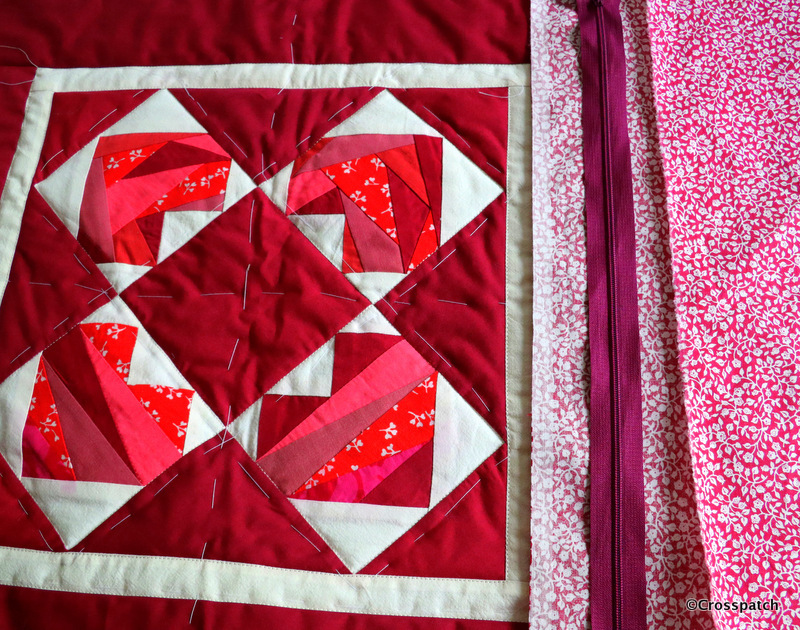 In case you are wondering I have a plan for the other two fabrics not used in this quilt, with the addition of that bright watermelon pink, I think I’ll make a disappearing four patch… watch this space. 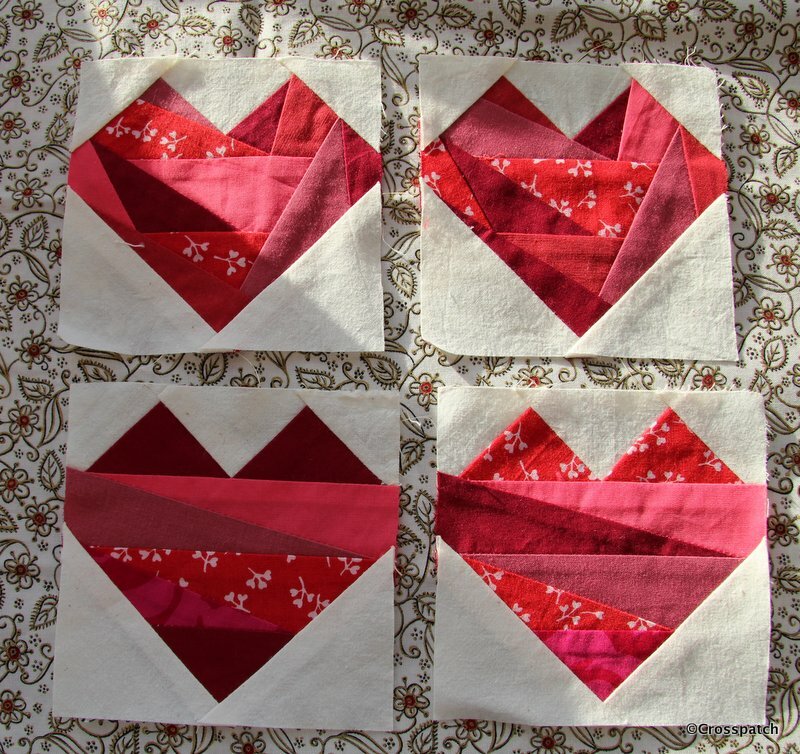 I found two plain fabrics and cut pieces to put the 4 little Hearts together to make a cushion front, but there was something not quite right. I couldn’t put my finger on it so I put it aside to think about it before going any further. As predicted I had to pack up all my belongings and move out of the lovely newly redecorated room in order to make way for the then 16 year old who I had to admit had outgrown the box room which was his bedroom. He was beginning his important sixth form years and would need a proper study space. All my sewing materials had to be packed up and moved into what was the box room ( we now call it Harry Potter’s room, the cupboard over the stairs) so the little hearts were packed up and moved (buried). The challenge came and went without me submitting my piece. 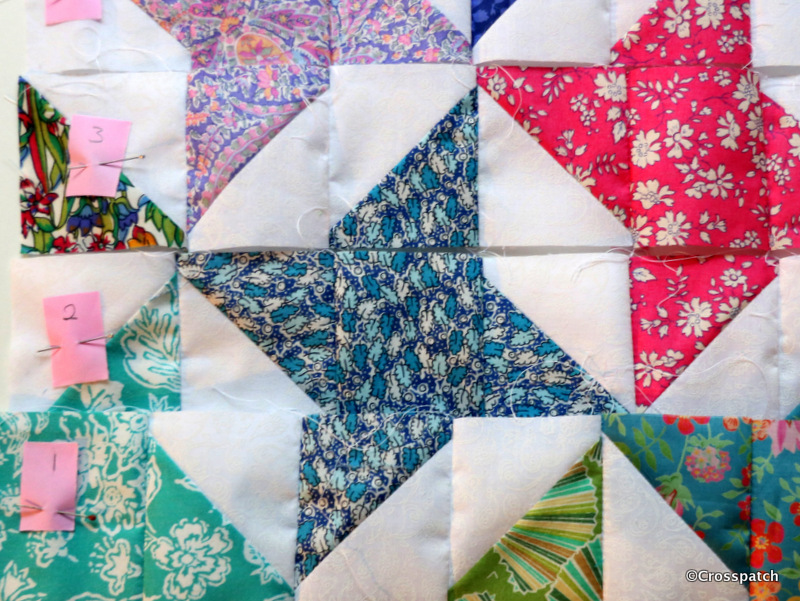 It was only when I realised our quilt group’s exhibition was due in a couple of months that I dug out my little hearts and some other half finished pieces in the hope I could produce something to show. The first step was to work out what was wrong with it. 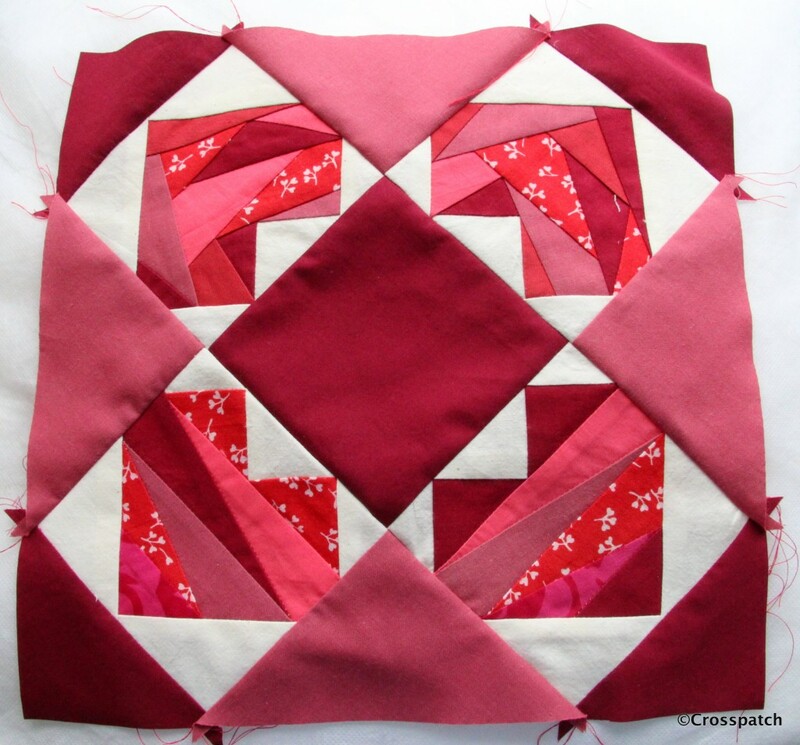 I realised the colours didn’t work together; the dull pink at the sides was just too dull, so I took it apart and replaced the dull pink with the darker burgundy colour. Sorted! 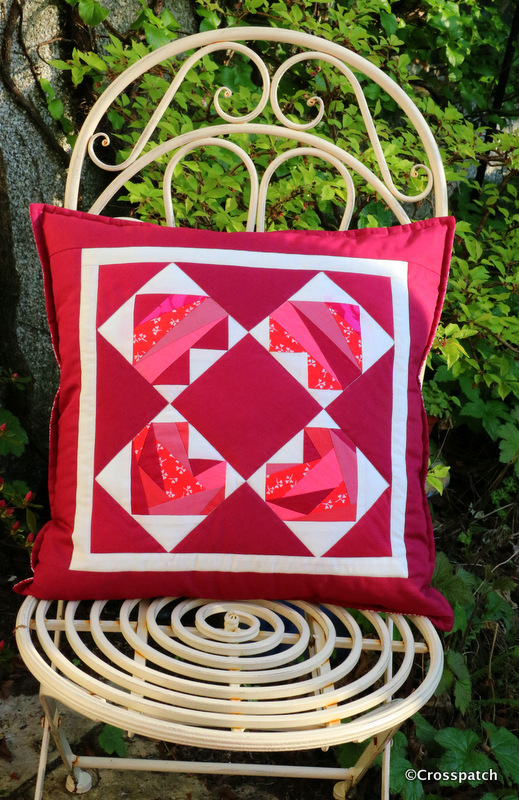 I wanted to make an 18” cushion and would have had barely enough of the burgundy to achieve that. 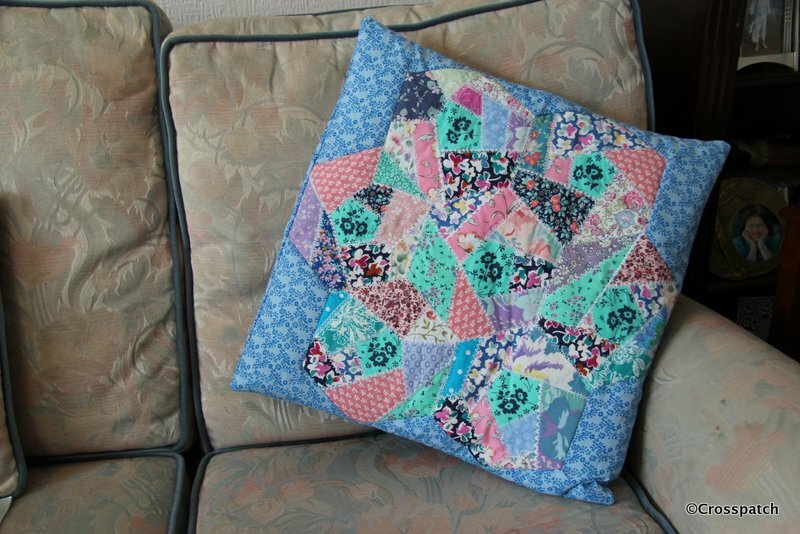 A 1” sashing of the cream calico, added a pretty frame to my 4 little hearts block and allowed me to achieve that 18+” square I needed for the cushion top. 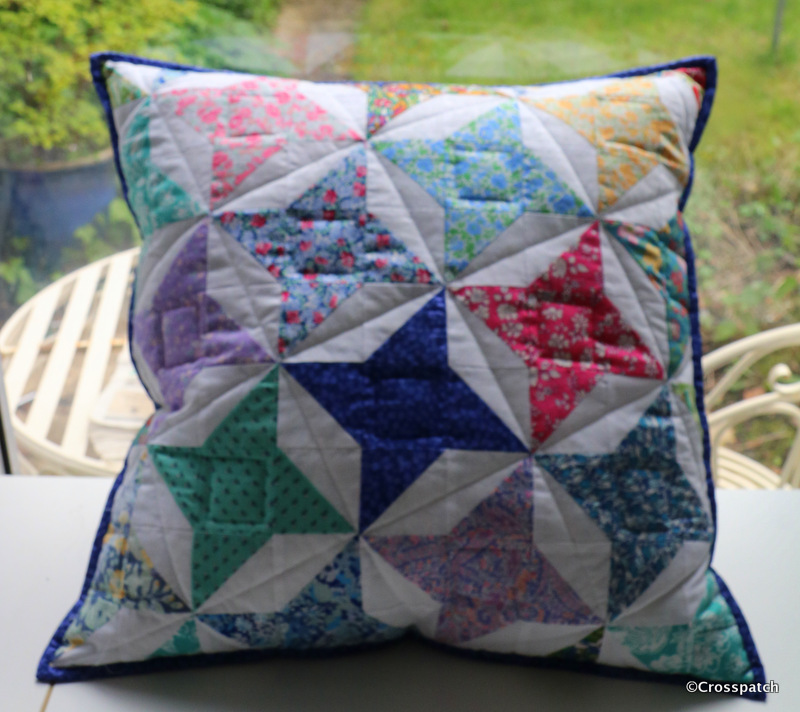 I really wanted to complete this cushion completely from my stash, and no cheating. So the backing was a found item, from my stash, it’s quite an old piece, a remnant left over, I think, from a skirt or dress from the 1980s. Happily it has finally found its purpose. The zip came from another stash, a lucky find in a charity shop, a whole carrier bag full of zips, over a hundred zips for £5. Finally when I had put the cushion together it measured just shy of 18.5’’ and the 18’’ cushion pad was a little loose in the cover, so a quarter inch top stitching round the edge gave a good finish to the edge, a little definition and pulled in the cushion size to just under 18”, it makes for a nice plump cushion, and was finished with a fortnight to go before it needs to be handed in. Result! 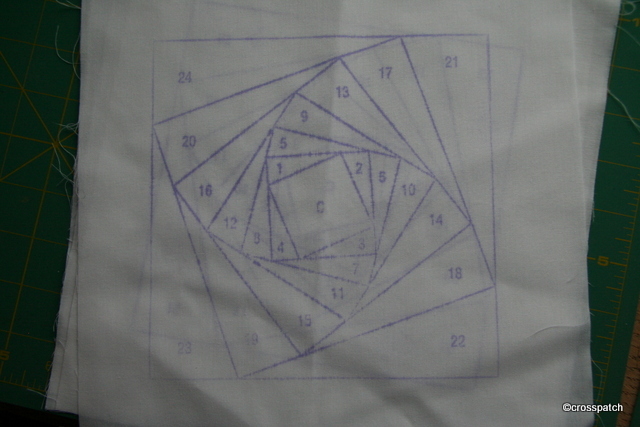 The technique for printing on fabric is really quite simple, cut a piece of freezer paper the same width as a piece of A4 printer paper, then cut a square of fabric and iron it to the freezer paper waxy side up, so the fabric is completely welded to the paper. 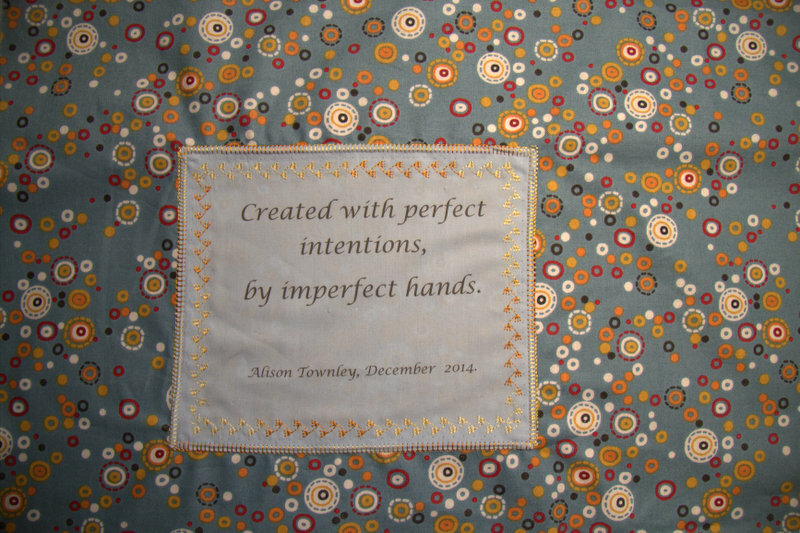 I created a word document for each line of the poem, and tried to set the line in the centre of the printable area, bearing in mind the fabric is ironed to the top 7 inches of the paper. 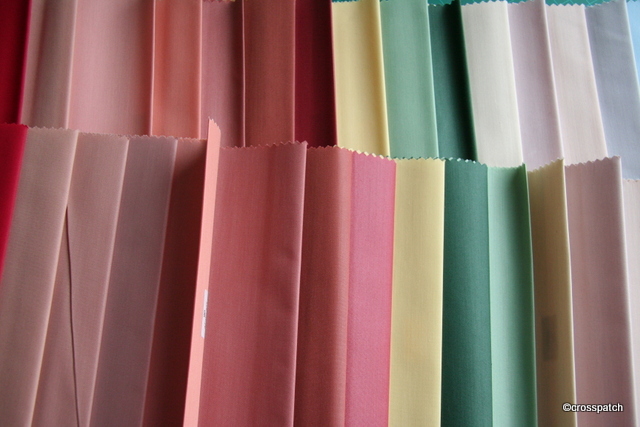 Put the paper in the printer, face down and press print.Then Presto, out comes a piece of fabric neatly printed with a line of the poem, just about centrally placed. 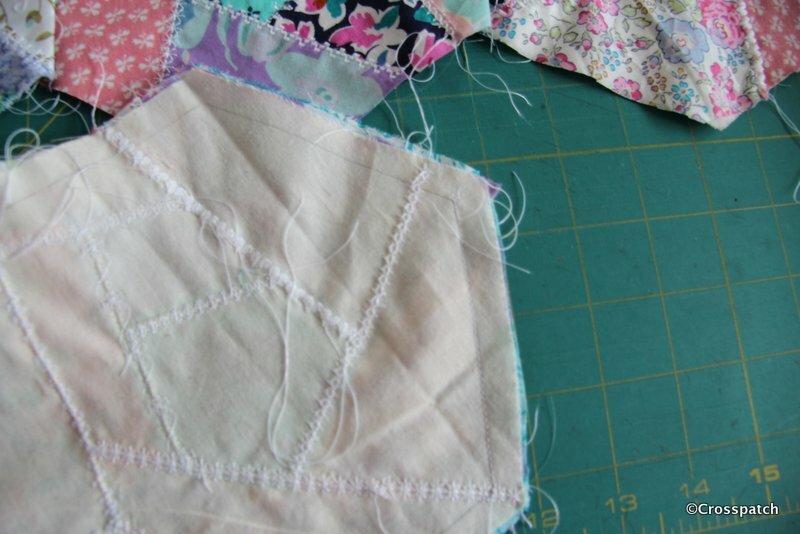 Peel the fabric from the freezer paper. 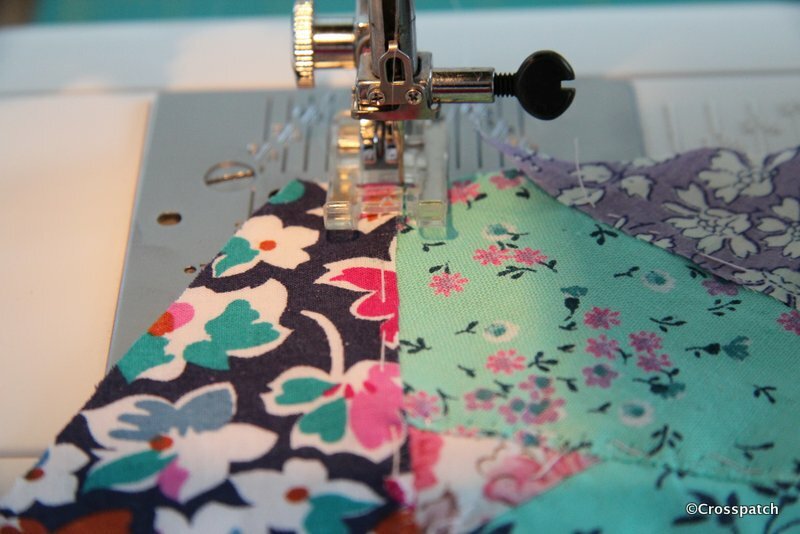 Trim the piece of fabric down to the desired size making sure the printing remains centred, and press with a really hot iron, to fix the ink onto the surface. Challenge four, putting it all together. 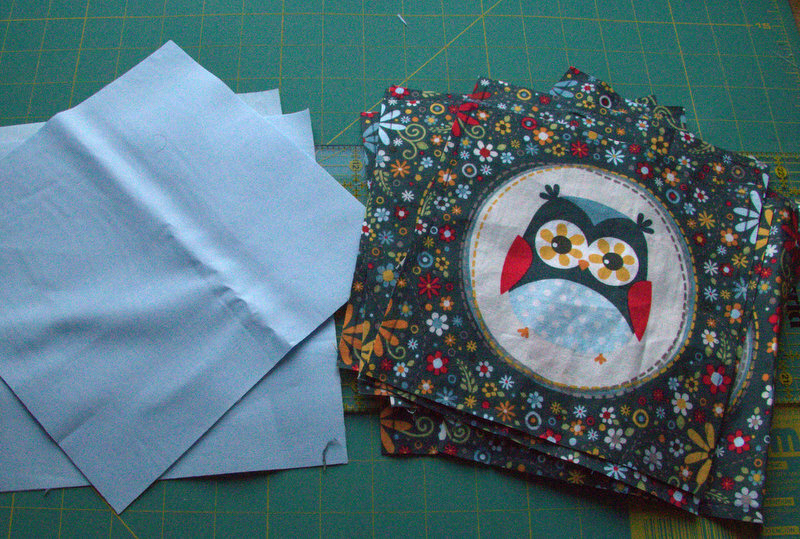 The sashing for the Owls came from my stash and was a perfect match, but I couldn’t find a fabric to sash the blue squares, nothing in my stash of fabrics was working, and I was running out of time. 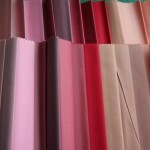 As you can see I tried various yellows, cream and taupe but it just wasn’t floating my boat and it looked too busy. 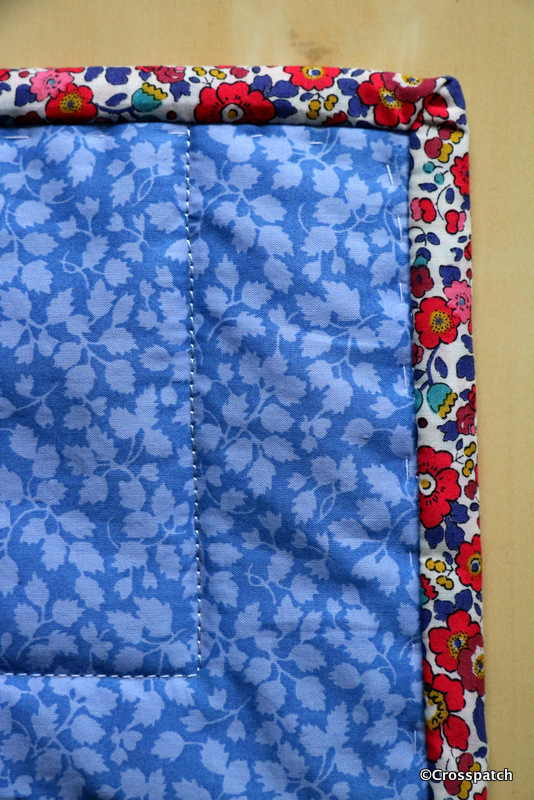 I decided the best option was to source some more fabric from the same range, the Internet was my only hope. 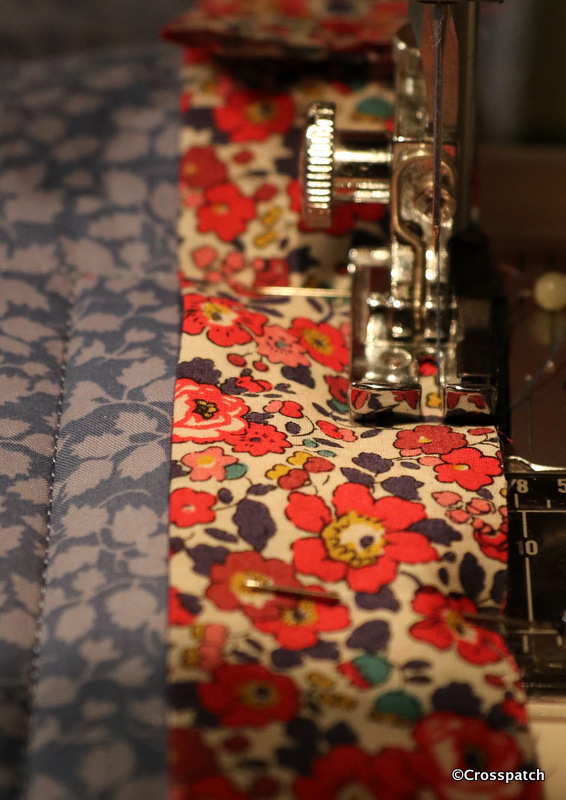 I only had half a selvedge as a clue to what the fabric range was called and who made it. 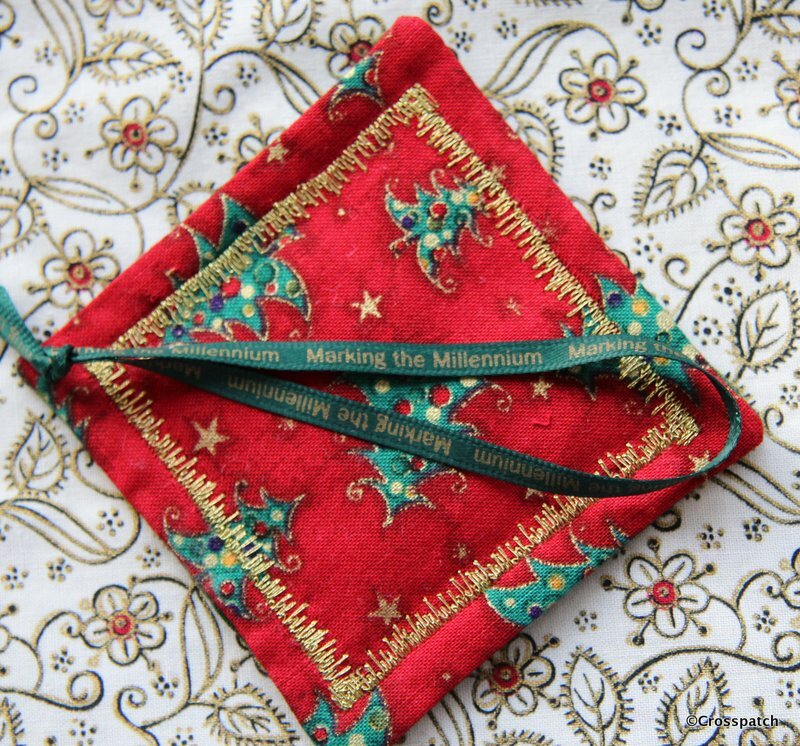 Nevertheless it only took me a few clicks of the mouse to trace it from the scrap I had, and find a supplier for the background fabric. 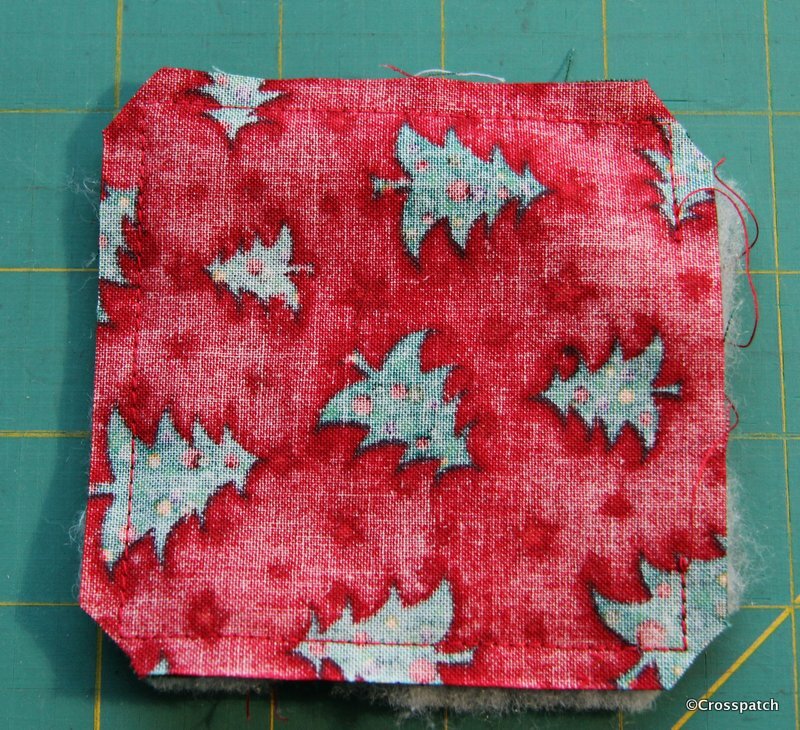 I also found another fabric from the same range for the backing. Flashed the plastic, and the fabric arrived two days later, I love the Internet. 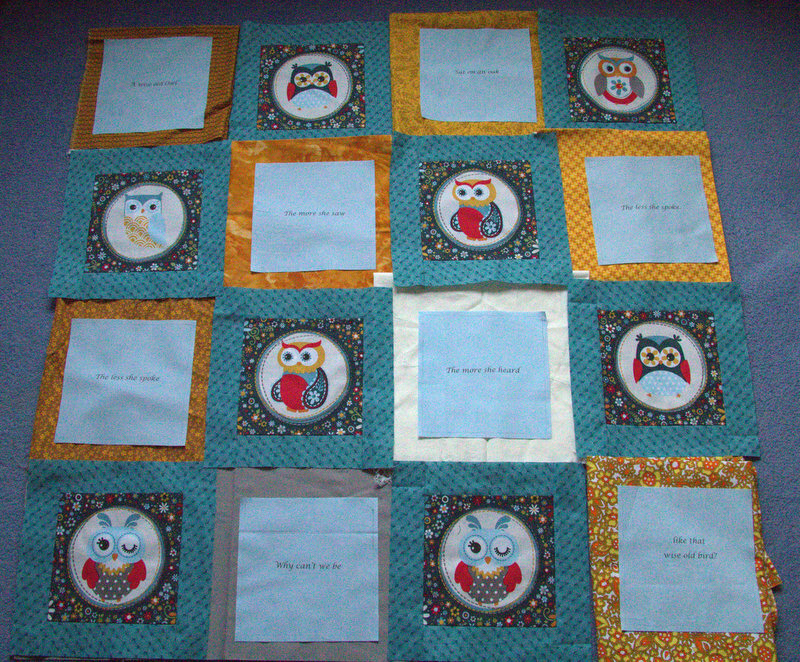 Challenge five, once I had the quilt top put together and the wadding and backing tacked in place I realised that the blue squares lacked something, there was too much plain space around the lettering, my first thought was to create a quilting template of an Owl and quilt the centre of the square but I wasn’t sure how that would work with the lettering. 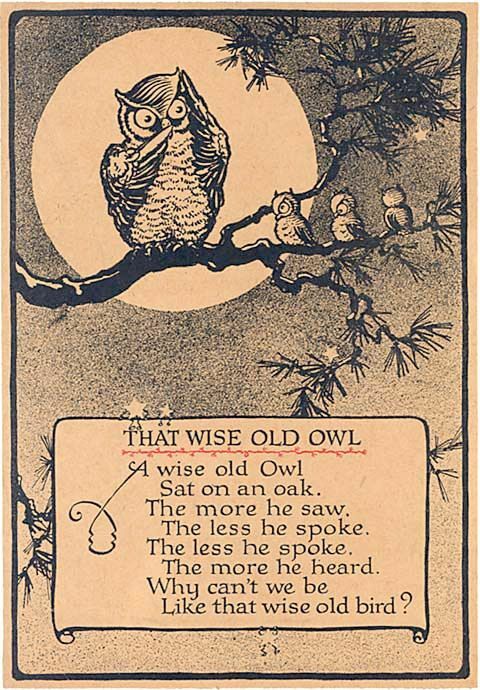 Maybe just a pair of Owl eyes, above the lettering, but that would be too asymmetric. 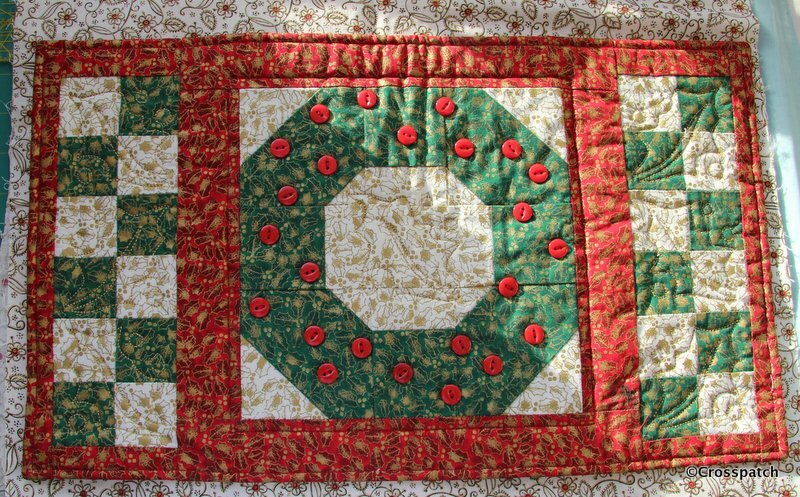 I decided to keep it simple, a circle in the middle to echo the Owl medallions, and some flowers embroidered round the edge to echo the flowers on the background fabric, and to add colour. 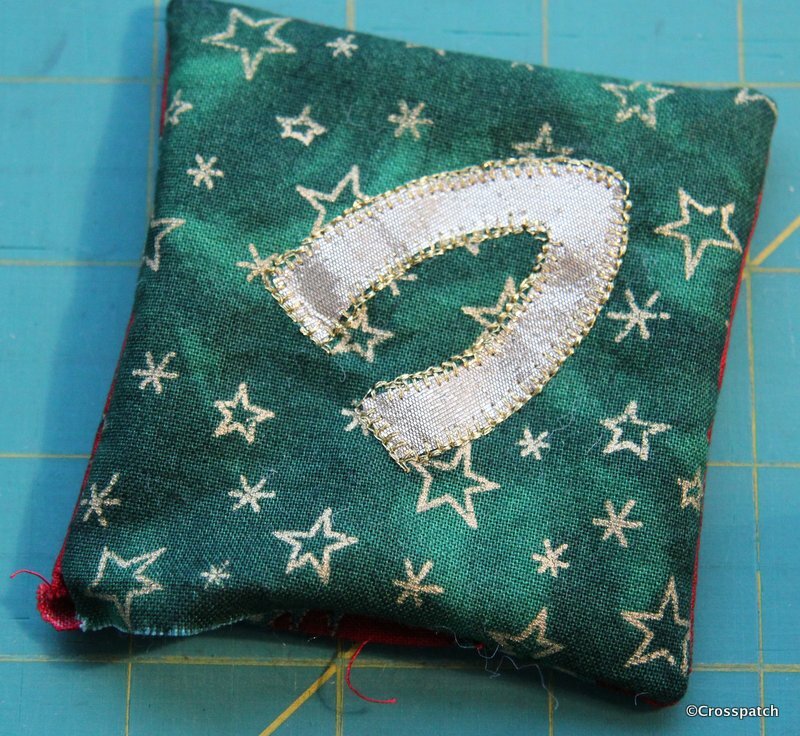 I used a space dyed thread, but I think a darker yellow or orange might have worked better. 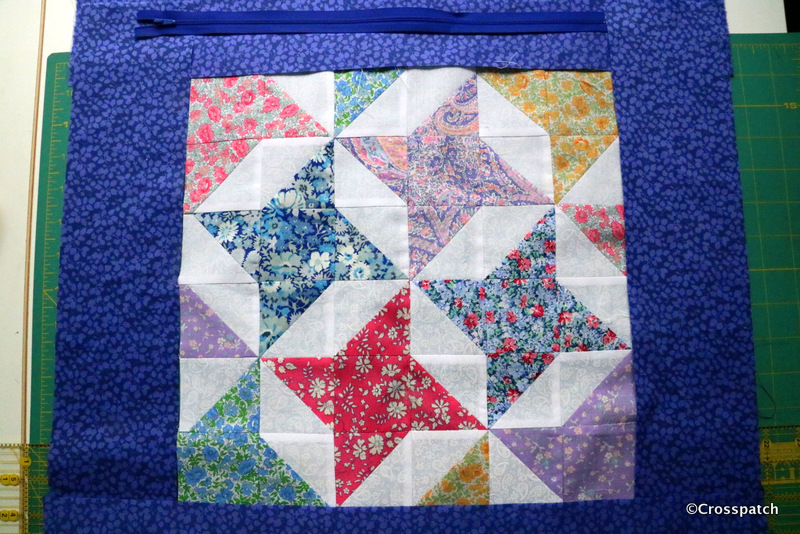 I used one of the rejected yellows I had auditioned earlier for the sashing of the blue squares to bind the edge of the quilt and to add a little contrast. 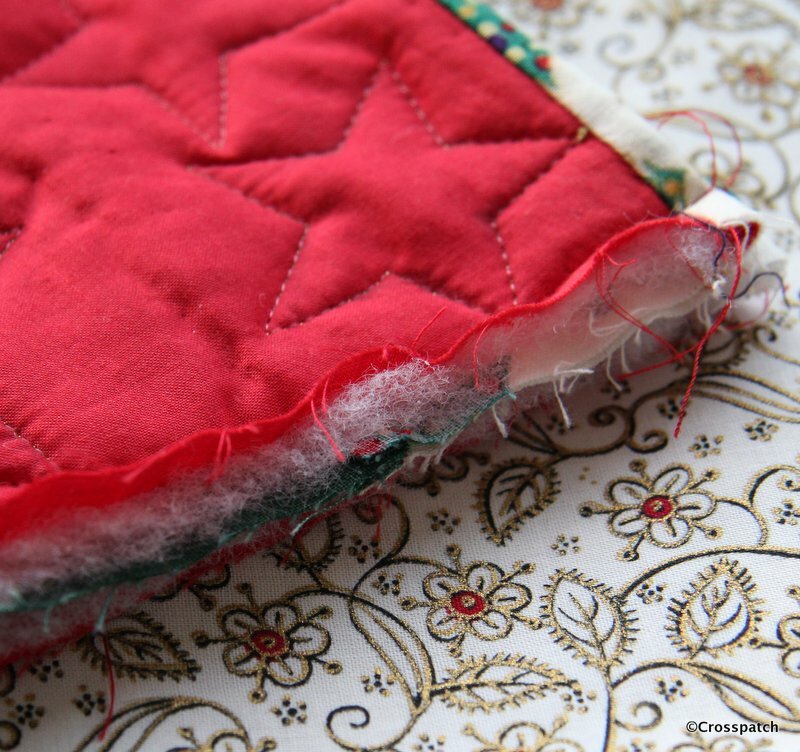 It worked well with the backing fabric too. 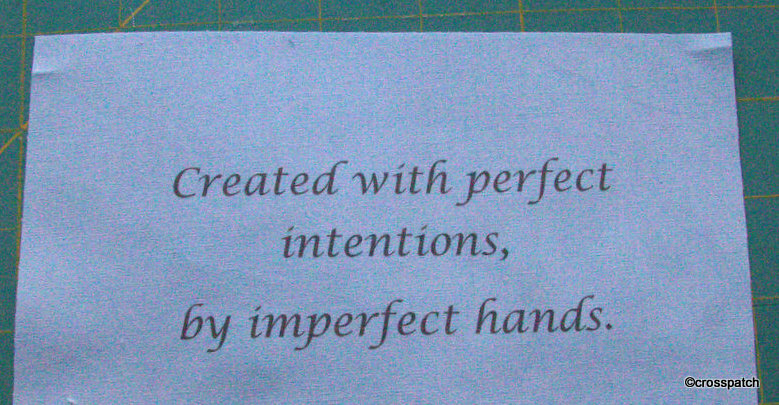 The label is a little wonky, but it matches the sentiment, made by imperfect hands. 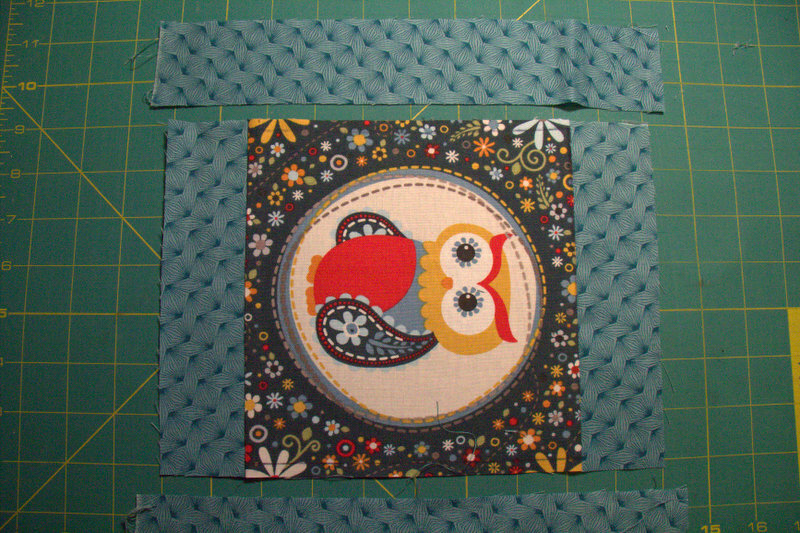 Owl quilt label for the back. 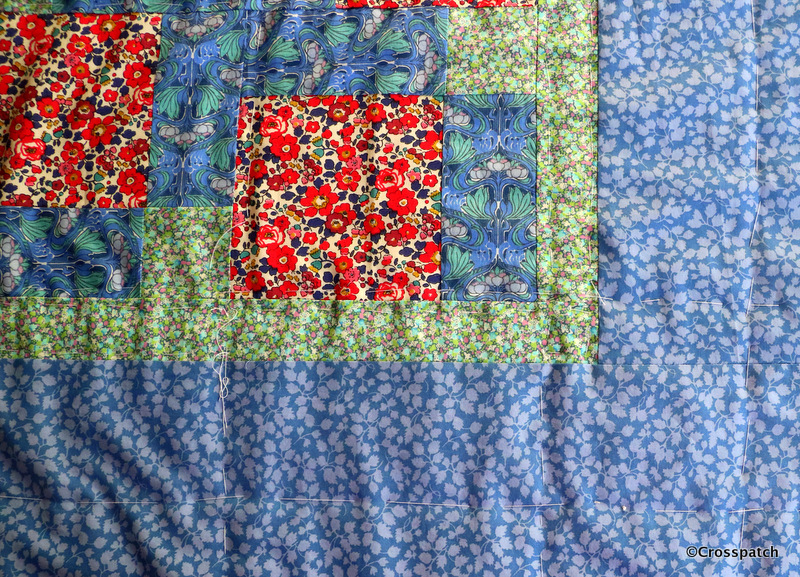 And so, I managed this Christmas to complete a quilt in time to give it to my Dearest Friend, and even better my lovely Sister volunteered to make a detour from her day out with her daughter to a Spa to deliver it in person to my friend. 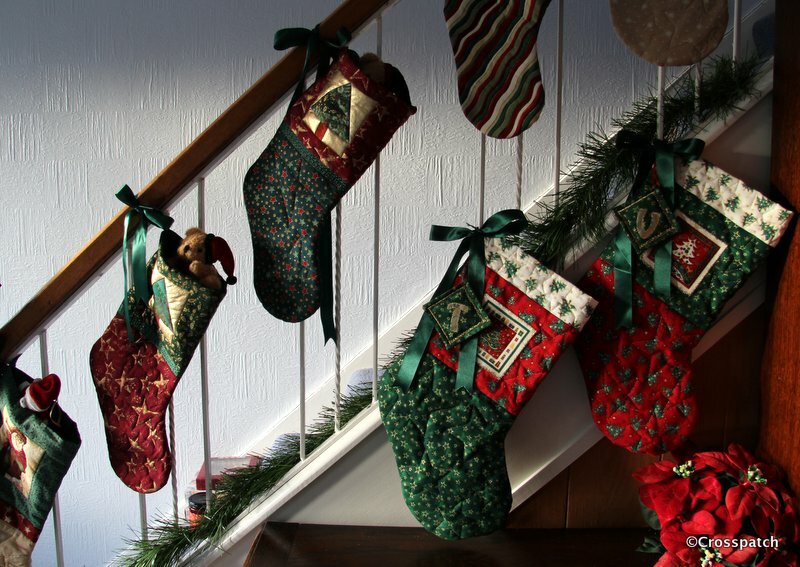 It was the day before Christmas eve. 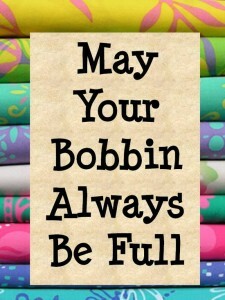 I am so blessed in my Friend, and my Sister. Thank you both for being there for me. 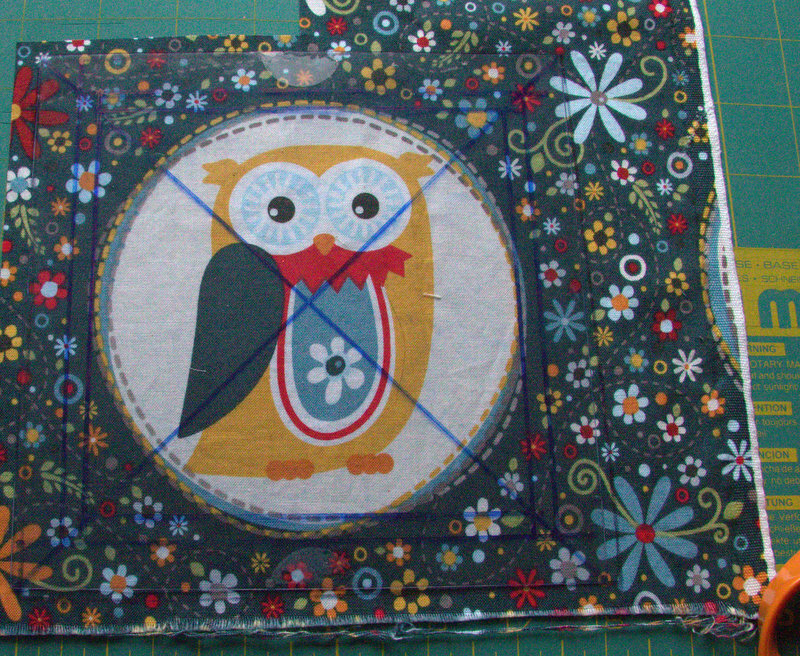 I have a dear friend who likes Owls, or “Wols” as she calls them, so when I came across this remnant of fabric being sold at my quilt group meeting I just had to buy it. I didn’t know what I would do with it but I knew I would come up with something. 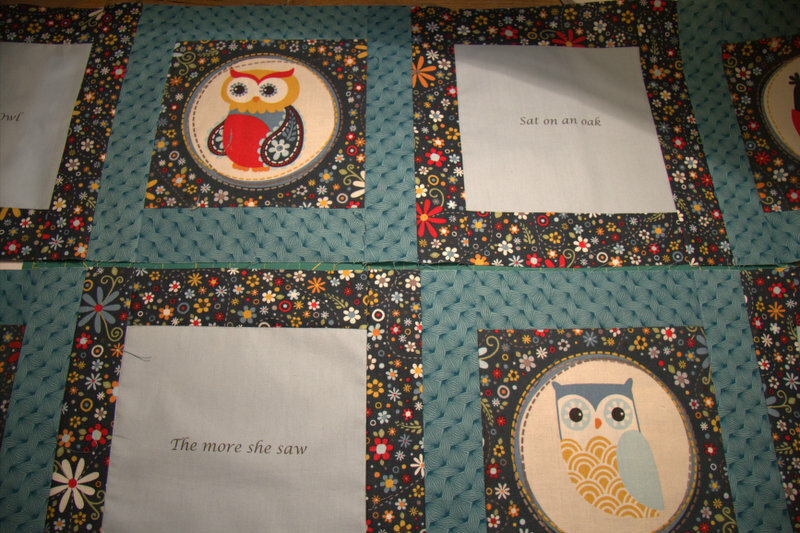 An Owl quilt, a lap quilt, a comforter, a virtual hug, that my friend could use whenever a hug was required and me not there to offer it. 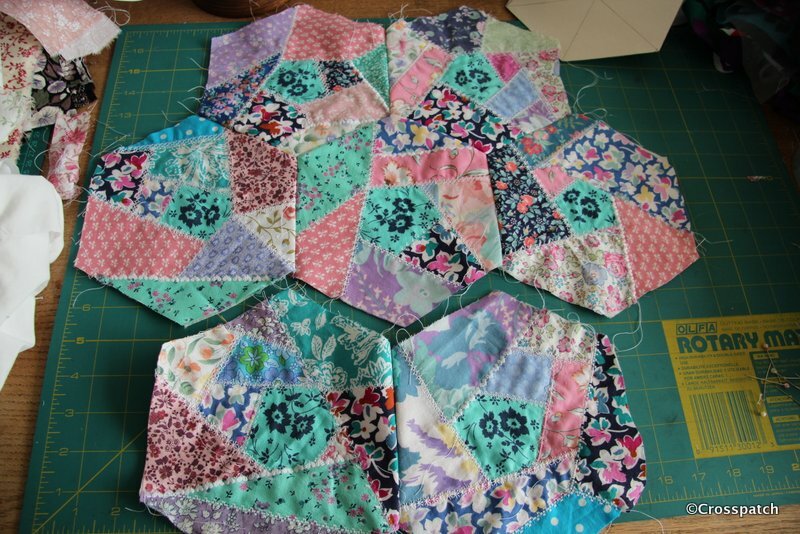 The first challenge was to cut out each Owl with as much fabric as possible surrounding the centre medallion, cut each one with the Owl dead centre in the medallion, and each the same size. The background fabric was too random to give me any help so I devised my own template using a piece of clear plastic packaging. 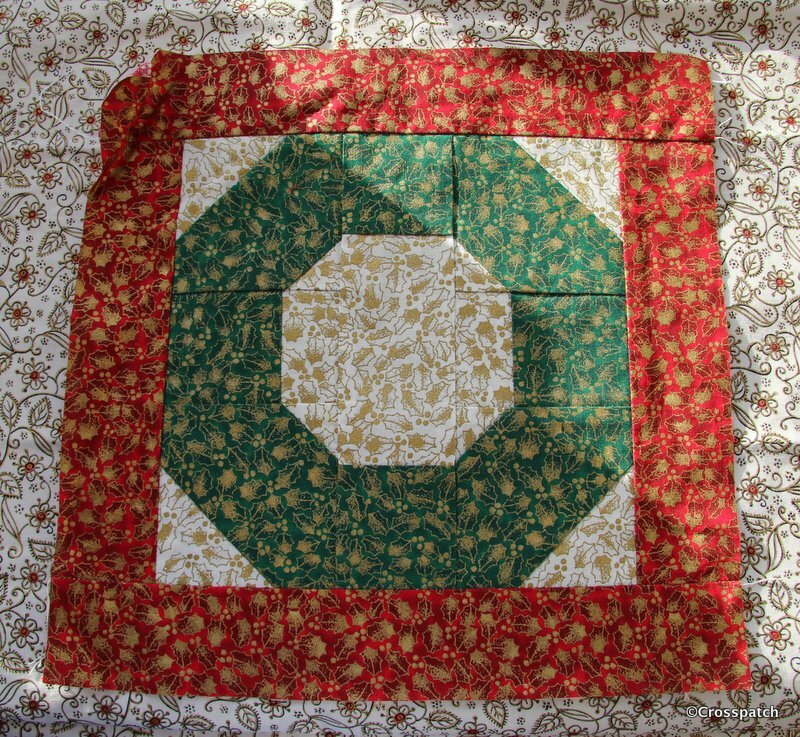 The circles were asymetrically placed so I needed two squares to fit them into, to “fudge ” a best fit with the centre of the medallion. 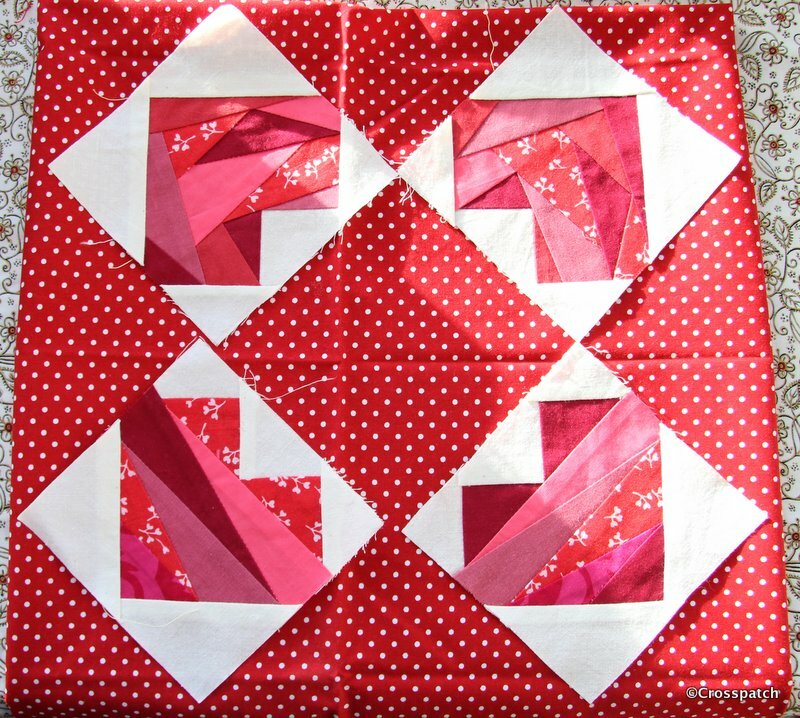 The outer edge of the template I lined up by eye, given the background pattern was random I knew it wouldn’t cause me too much problem if it was slightly off the grain. 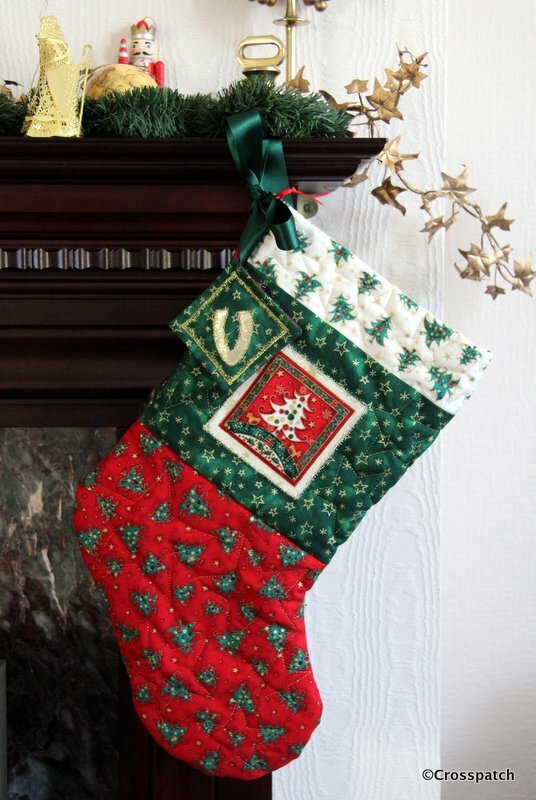 In any case I don’t think it was printed entirely plumb with the straight grain of the fabric. 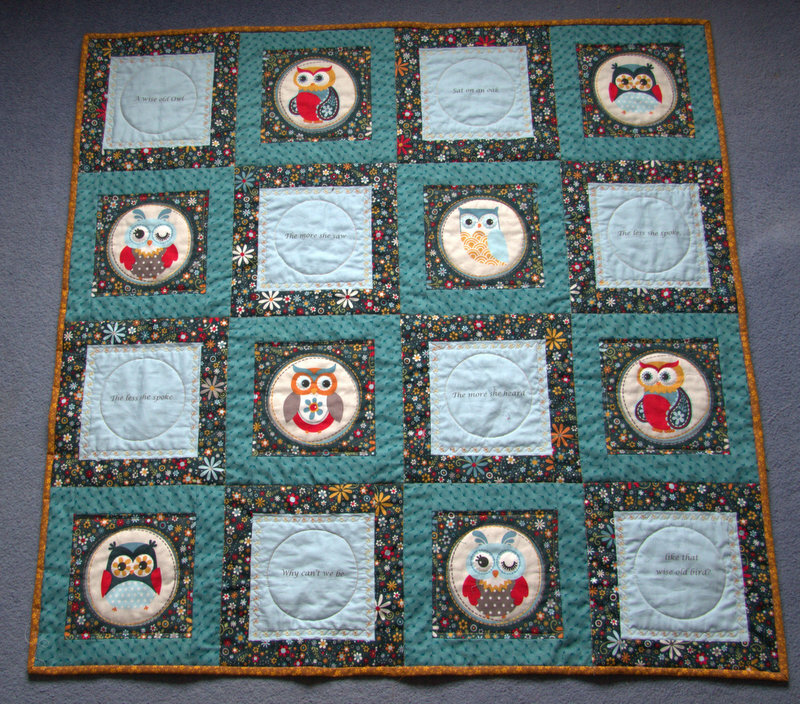 Next challenge, there were only 10 complete Owl medallions, and no way of buying more, I had to come up with a design which would make a lap quilt, at least a metre square, and quickly, I wanted to give it as a Christmas present and it was well into November when I began. 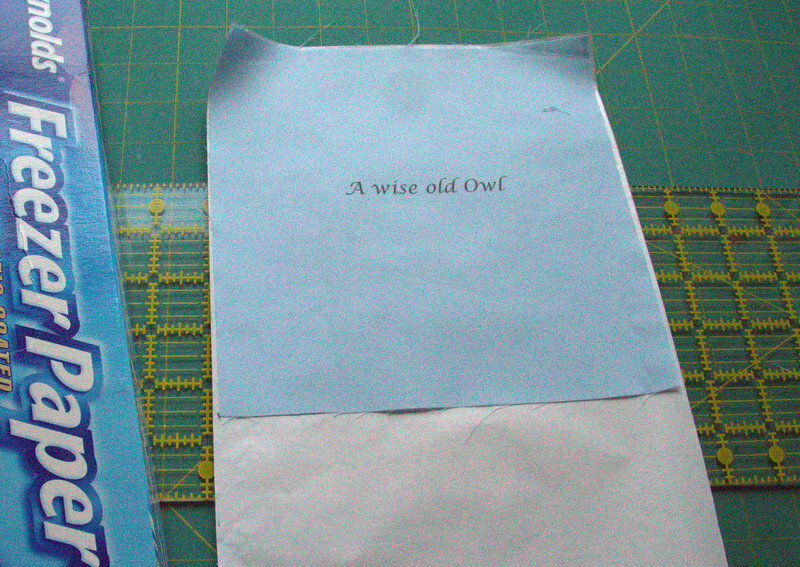 While I was cutting out the medallions, I was reminded of an old nursery rhyme about a wise old Owl. 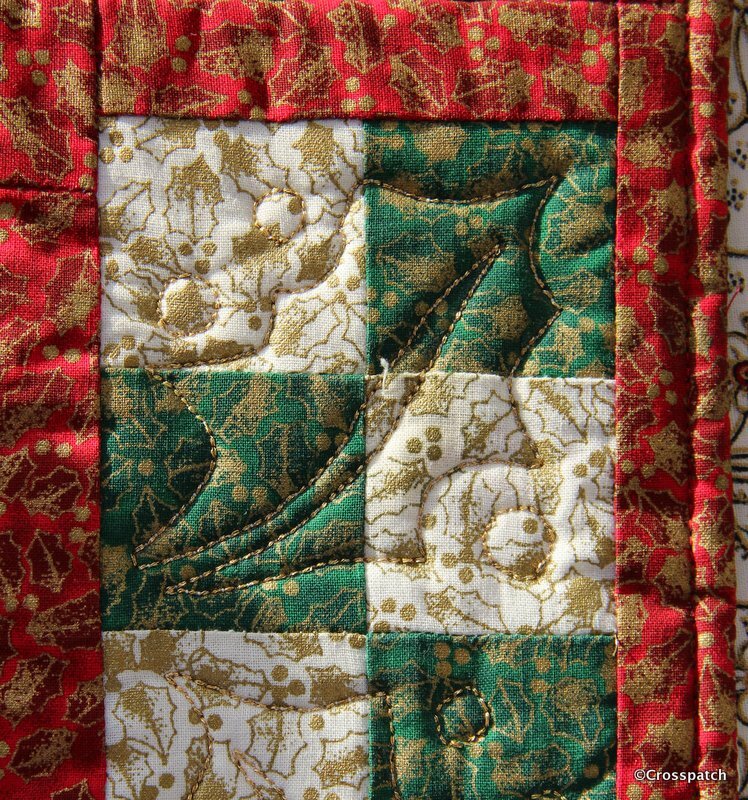 Happily its 8 lines long so I could alternate each of 8 Owl medallions with a line of the poem in a plain fabric, but what fabric? 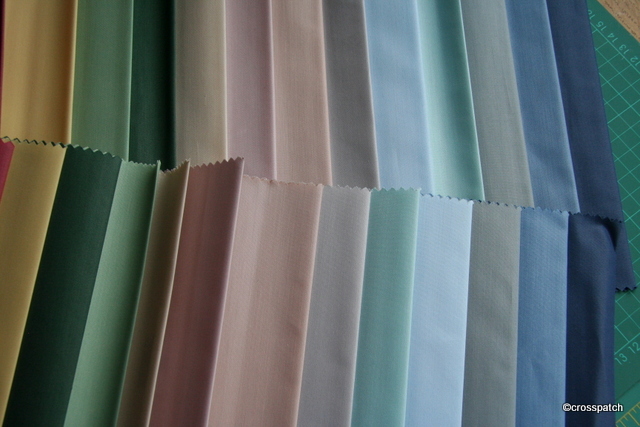 I went to the fabric shop thinking cream, and came home with blue, it often happens that way, when I get to see the fabrics together what I had in my mind’s eye just doesn’t work and so I always have plan B.
what to put with it? 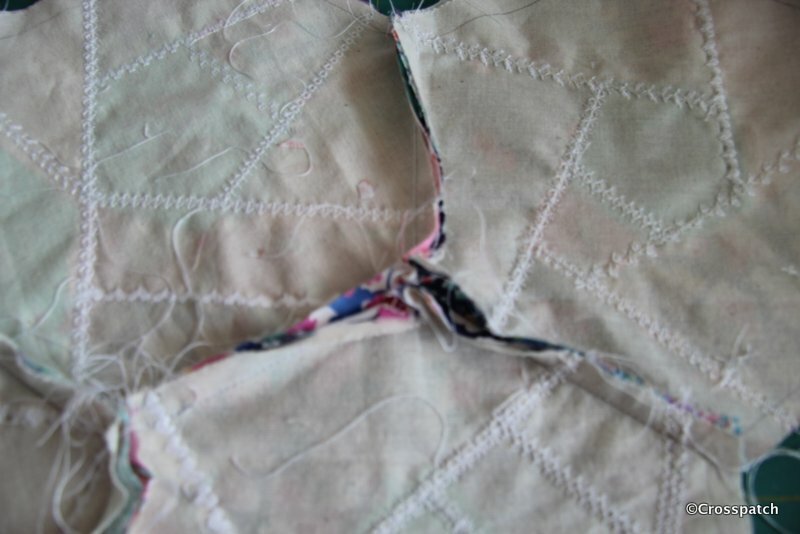 Challenge three, how to apply the lines of poetry to the fabric? My handwriting is not good enough. 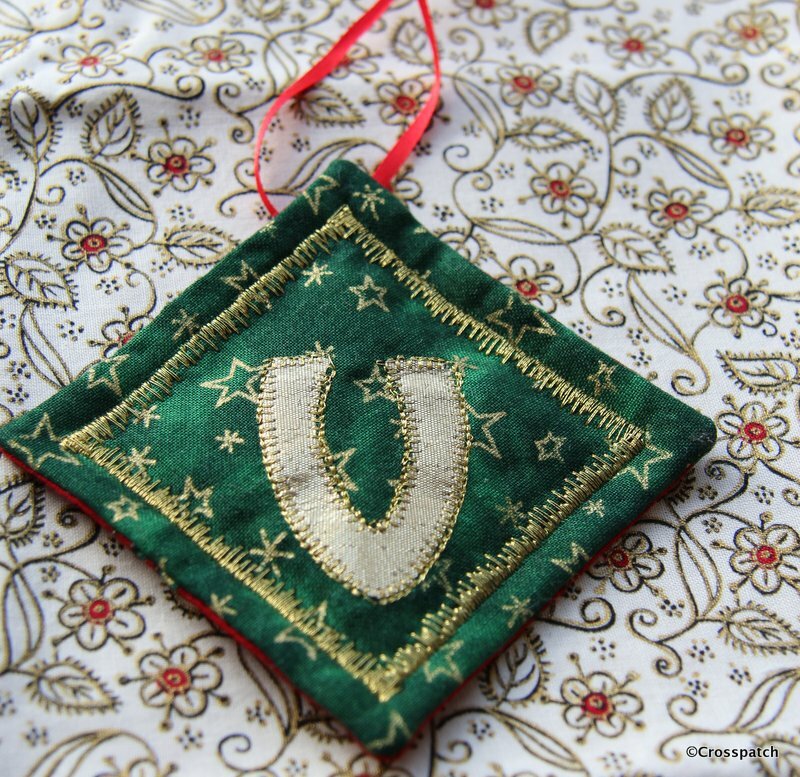 My hand embroidery is even less appealing, not to mention how long it would take me to hand embroider each one. 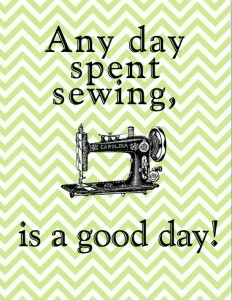 I could have used machine embroidery but I wasn’t convinced my machine would do a good job either, and centring the text would be a nightmare. I did however have a plan. 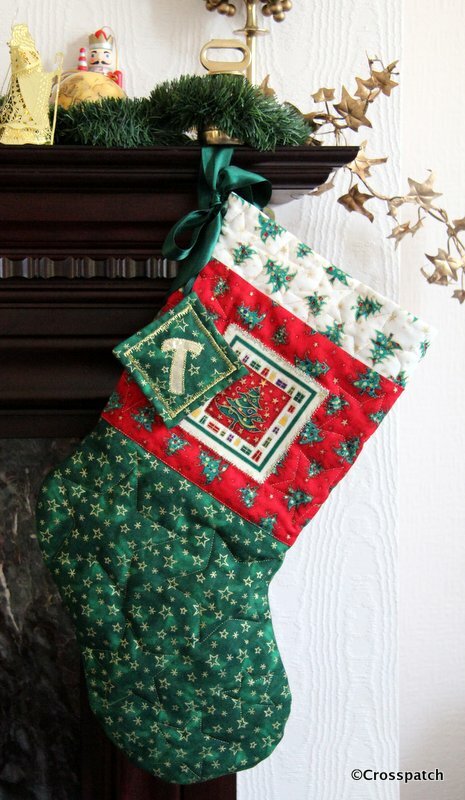 I’d read on Pinterest a number of articles about printing onto fabric using an ordinary household ink jet printer. 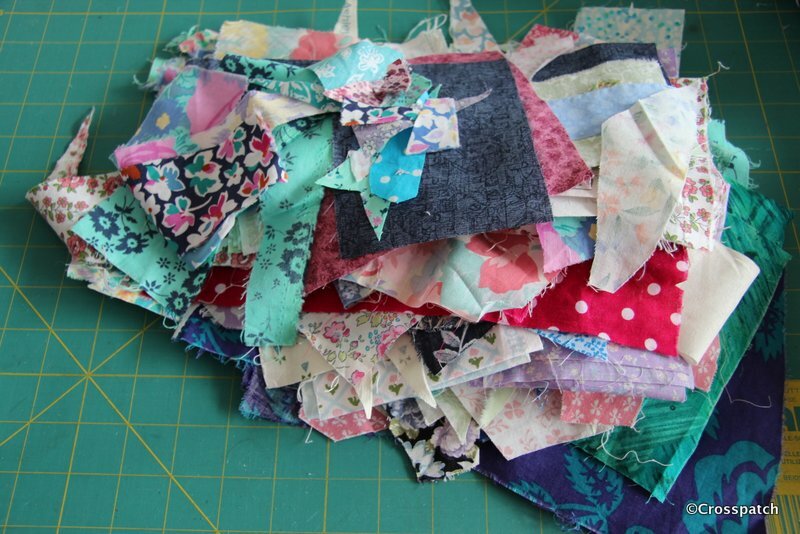 All I needed was some freezer paper and an iron, how difficult could it be? 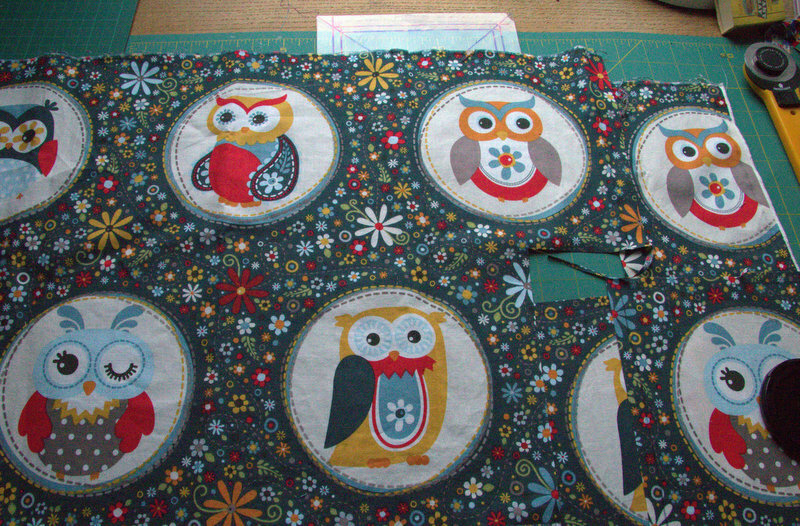 The plain fabric was cut slightly larger than the Owl medallions and the printing planned to be in the centre and then trimmed down to the right size leaving a little wiggle room all round in case the centring wasn’t accurate.